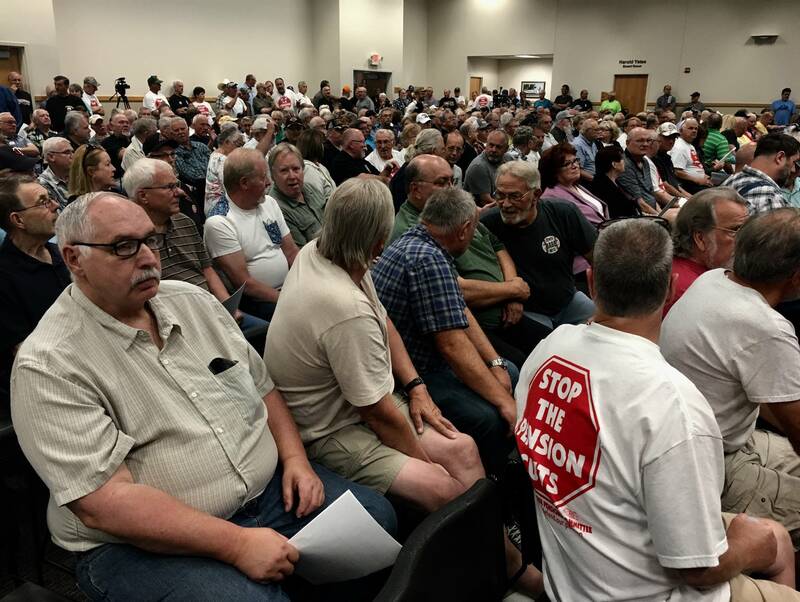 Chuck Justice is a retired truck driver of 30 years, and says the threat to his pension benefits is "almost like it's the end of the American dream." "I worked hard, I grew up in farm country in Iowa, I started working when I was 13 years old and it was something that we were banking on — and now the rug is getting pulled out from underneath us," he said. "It's very disheartening." 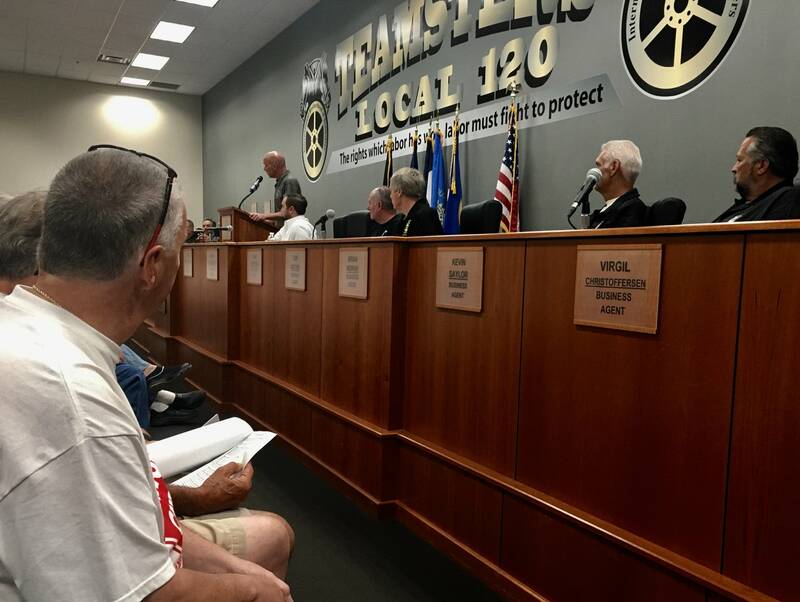 Justice, from Woodbury, Minn., was among several hundred union workers and retirees who met at Teamsters Local 120 in Blaine on Saturday to discuss how to protect their pensions, and urge action by lawmakers. Analysts estimate that some multi-employer pension plans, covering a million people across the country, could run out of money within 20 years if nothing is done. Jeff Brooks, co-chair of the Minnesota Save our Pensions campaign, said more than 17,000 Minnesotans could be affected. He said they're afraid their decades of hard work won't be rewarded in full. "This is a life-changing issue," Brooks said. "There are a lot of people who will lose homes, if this thing completely crashes and there's nothing done at all. This will put people literally into poverty, will move people directly out of the middle class and into poverty — there is no doubt about that." According to the American Academy of Actuaries, about 1,400 multi-employer pension plans cover workers and retirees from many unionized industries. About 100 of those plans have been classified as "critical and declining" — meaning they may not be able to pay out all the benefits that their members are owed. The federal government has been working for years to find a solution to keep pension plans — and the government agency that insures them — from going insolvent. A bipartisan committee in Congress currently is working to address the issue. Justice said he hopes more lawmakers on both sides of the aisle will agree to help find a solution. If not, he said the results will be catastrophic for families who may see major cuts to their monthly income. "My main concern is not for myself; my main concern is for my wife," Justice said. "If I would lose the pension, it's harder on her. At the time we started contributing to the pension fund there were no 401(k)s or other means of saving for retirement other than making extra house payments or whatever. This was our retirement." Brooks said the uncertainty is particularly stressful for retired workers. "They're in their kitchens and their living rooms, talking to husbands and wives and they're afraid; they feel pretty isolated at their age ... it's an isolating kind of situation to be in," he said. At the state level, Minnesota Gov. Mark Dayton signed bipartisan legislation last month to fully fund Minnesota's public employee pensions over the next few decades. That bill, which affects more than 500,000 people, received unanimous support in the state House and Senate.